I’ve got a few problems with my back at the moment (well, my back, hips, and shoulders actually, but my osteo is on to it) so I’m taking a little break from knitting this week. 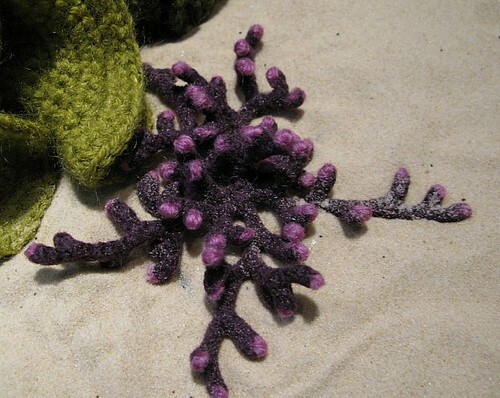 There was actually much frantic pre-wedding knitting last week, but I’ll fill you in on that another time. I’ve had a rather fun time indulging in some non-knitting crafts for a change; I missed out on the opportunity to get in to crafts as a kid so I’ve been relishing the chance now! Lots of cutting and sticking and gluing is very good for the soul. I’ve recently moved in to a new flat with a huge shiny fridge; this was in contrast to my last flat which had an integrated under-counter fridge. So I find myself with a need for fridge magnets – lots of fun to make! I wasn’t thrilled with how the first few turned out, as the fabric is a little bit flimsy. (I’ve made loads of fabric buttons before, but with a slightly heavier weight fabric, and they’d turned out much better). Then a stroke of genius hit, and I whipped out the starch that I’d bought for my wedding garter. Much nicer! You see those crinkles around the edges? Later versions are now nice and smooth. I’ll keep the second-rate magnets for myself, and make nicer ones for friends. I have a tendency to get a bit carried away and over-think things, but I’m pleased with how the parcel turned out. I really hope my swap partner likes it! 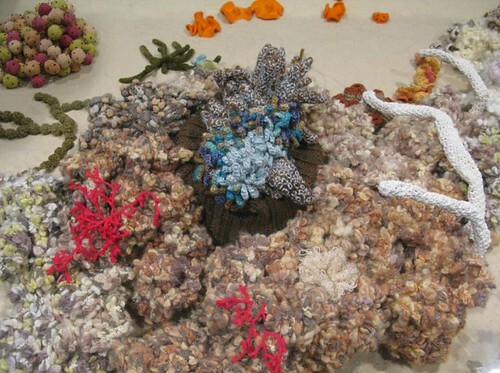 I went to the Hayward Gallery at Southbank on Sunday afternoon to see the Hyperbolic Crochet Coral Reef exhibition. It was the last day of the exhibition in London – I have a habit of leaving things until the last minute. 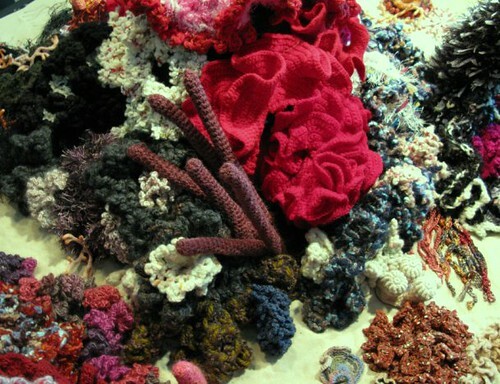 Many of you will already know about the exhibition, but for those who don’t, it was designed to raise awareness of the destruction of the Great Barrier Reef, all through the mathematical wonder of hyperbolic crochet. 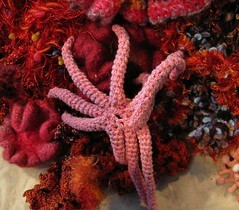 There was such diversity in the work, with the displays made from so many different yarns in so many different shapes. 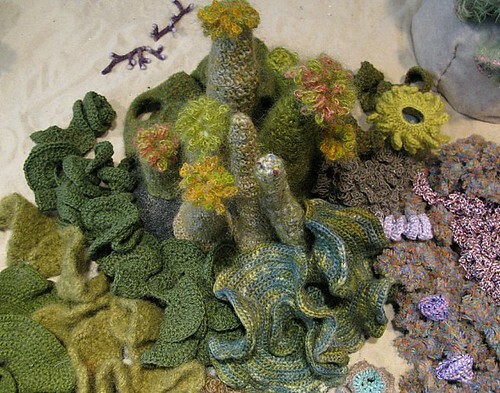 If I didn’t have such a ridiculously long knitting queue, I’d love to play around with some hyperbolic crochet shapes. My new camera arrived, so I went out for a wander around Brick Lane in London’s East End. Sadly much of the area has been well and truly ‘cleaned up’ (*cough* Spitalfields) but thankfully there’s lots of interesting stuff at the Old Truman Brewery. On Sundays the brewery site hosts two great markets, Sunday Up Market and Backyard Market – make sure you go to both. Inside you’ll find lots of young creative types selling their wares, and this is probably the closest I’ve found in London to some of my very favourite markets back in Melbourne. Somehow I managed to come away without buying anything, which certainly never happens in Melbs. I don’t know a thing about cross-stitch, but it seems to be enjoying something of a resurgence in line with other crafty pursuits. They’re looking to set up some cross-stitch evenings in local London drinking establishments, so get in touch with Random Monkey Design if you’re interested.